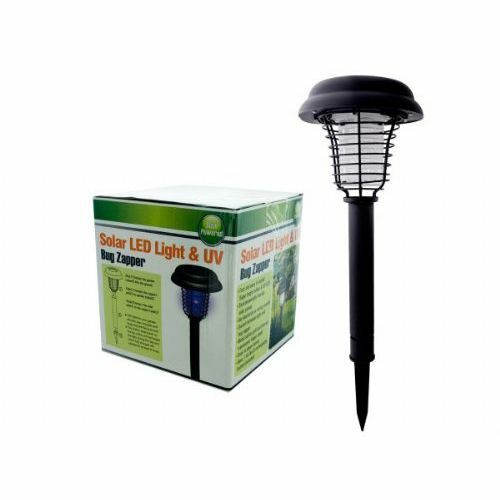 A perfect garden item, this Solar LED Light and UV Bug Zapper easily switches between light and bug zapper with absolutely no electricity or wiring needed. The built-in solar panel on the top of the unit recharges the light during the day and will have a full 8-hour charge. Light/zapper has a metal safety grill and internal translucent finger shield. Uses 1 AA NI-Cd rechargeable battery (included). Comes packaged in an individual box. Box measures approximately 6 x 6 x 6.25.